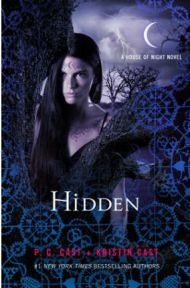 As has become standard in recent House of Night novels, Hidden is narrated by a range of characters. Only Zoey is in first person, the rest being in third. With different story threads and the action taking place in different locations (although in Hidden, it is all in Tulsa), this allows us to keep up with everything that is going on, and to see events from different perspectives. Each character’s narrative sections really showcases their different characteristics, such as Neferet’s skincrawling evil, Aurox’s anguish over who he really is, and Zoey’s struggle to fulfil the role that is expected of her. Perhaps the most interesting character development of Hidden is that of Kalona, Neferet’s former consort. We learn more about his past, more about his relationship with the goddess Nyx, and most interestingly of all, we are introduced to another character through him, let’s call them a former acquaintance, who does not quite to be what they should be. Another character development is a continuation of the rift between the “Twins”, Shaunee and Erin. Although rift doesn’t really describe it any more – it’s more on a par with the Grand Canyon. Erin makes some very questionable choices, and her future as part of Zoey’s circle seems very uncertain. I have to admit I’m not sad about this, as the Twins were annoying, immature and a waste of space. On her own Shaunee is an interesting and thoughtful character, and while Erin may not be showing hidden depths, she is at least showing signs of contributing something to the storyline. The first few novels of the House of Night series were annoying in their use of teen-speak, but this has eased as the series has progressed. The teen-speak and pop culture references are still there (True Blood being the most obvious for me in Hidden), but they are definitely toned down now, and also perhaps less painfully obvious now the story itself has matured and become so absorbing. Hidden has a few story developments, but not a great deal; there is obviously a story to the novel, but there isn’t a huge amount which advances the overall story of the series.. The end holds promise of a lot more action to come, and there an intriguing hint about Neferet’s past – which will surely be explored in full in the forthcoming Neferet’s Curse novella. I thoroughly enjoyed Hidden, and was as hooked as ever, yet once I’d finished I realised I had been hoping for the action to be ramped up a bit, for the story to progress to the next stage. Given the ending though, I’m sure that there is plenty of action to come, and that the story will move to the next level.